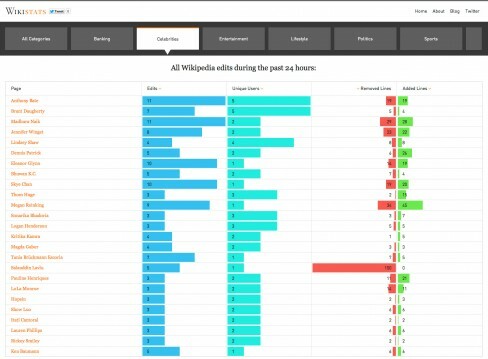 DataSift has added Wikipedia as a data source in its Social Data Platform, allowing companies to track mentions of products and services in real-time on the internet’s largest user collaborated encyclopedia. DataSift is a social-data company that collects, filters and analyses unstructured data from internet media such as Amazon, Facebook, Flickr, Twitter and YouTube, that companies and organisations derive value and gain insights from. The announcement was made earlier today at LeWeb London 2012 by DataSift’s founder Nick Halstead. Our own Piers Scott followed the conference closely in London and you can read his commentary from both days here. In addition to adding Wikipedia as a data source, DataSift has also created Wikistats as a showcase of what’s possible with this latest data reference. Wikistats provides a “real-time insight into the trending articles on Wikipedia in the last 24 hours” by filtering and analysing the stream of new articles and article edits. It’s similar to Tweetmeme (itself another DataSift property), a service that identifies the most popular content on Twitter. Wikistats groups Wikipedia articles into popular categories like celebrities, politics and sport using DataSift technology, and displays the number of edits an article has received, how many users have edited a particular article and how many lines of content were either added or removed. The correlation between activity on Wikipedia and activities occurring in the social landscape is evident. Major news events for example increase page impressions and content changes to related Wikipedia articles and this is reflected in real-time on Wikistats. Articles that become popular on Wikipedia are usually based on current “news events, research updates, or highly controversial subject matter”. There’s no denying that Wikipedia is an important and largely reliable source of data. It’s consistently one of the highest ranking websites in any given Google search, and overall is the sixth most visited website. Last month it received over 15 billion page views and typically witnesses 7,100 new articles added each day. As a marketing tool Wikipedia is just as important as any other social network and DataSift realise this.